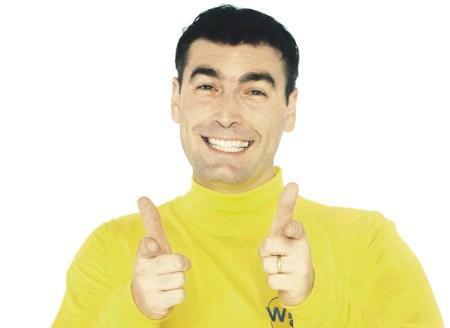 Yellow Wiggle Greg Page is the featured guest in this episode all about Christmas cheer. I ask Greg about his favorite Christmas songs and about how his family spends Christmas. I’ll also ask him about the rumored Wiggle reunion show and how he’s able to get a song like Fruit Salad or Hot Potato out of his head. My kids change their minds every day about what they want for Christmas. Would it be wrong to just give them money and say, get what you want? I’ve had to schedule three photo shoots just to get one family picture with our toddlers looking happy-enough to be on a Christmas card. Are there any other options for a family Christmas card I should know about? I know my toddler will give me something for Christmas, but it could be anything. Can you give me some great and not-so-great ideas about what he might get me so I can be prepared to fake a smile if necessary? In Valencia, Spain, a mom and dad’s decision to have a traditional Christmas celebration is causing a stir among friends and relatives. They know that a traditional Christmas for their family means all of the kids will be tired, hungry and grumpy, which means they will be opening presents that don’t belong to them, demanding to be held all the time and spilling cranberry sauce on people who refuse to give them eggnog. The friends and relatives who hope to change these traditions are expected to be reminded what it was like when they had kids, or if they don’t have kids yet, they’ll be told how it will eventually be when it’s their turn to try and control kids amped up on Christmas sugar. Meanwhile, in Vancouver, Canada, police are still searching for the thief who stole Santa’s cookies last year. The cookies were discovered missing by a four-year-old who woke up very early in the night to see if Santa had brought her presents yet. But the only thing she found was an empty plate and her dad trying to put together a bicycle that looked a lot like the bike she got from Santa the next morning. The dad remains a person of interest in the case, but he argues his daughter must’ve been dreaming because Santa’s elves are the only ones who could’ve put her bike together. And finally, a new study finds that 9 out of 10 parents prefer Christmas Eve to Christmas Day. The reason? Because it’s the one day when kids don’t fight going to sleep, at least not too much. The ten percent of parents who were undecided about which day they prefer said it was because they don’t teach their kids about Santa Claus, but now that they’re thinking about having one night when kids go to sleep, they’re strongly considering a Santa visit.